Reserve your space TODAY for Livingston County?s only wedding expo! 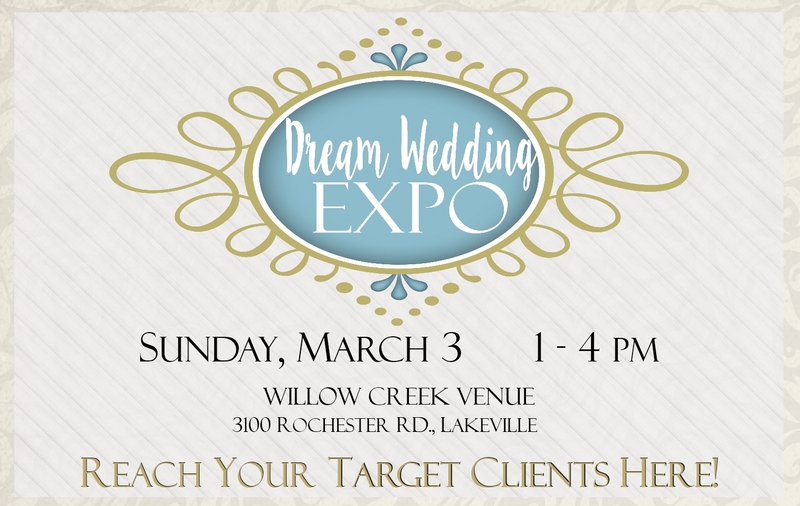 Exhibiting your business in the Dream Weddings Expo is, first and foremost, an economical way to advertise your business and have direct contact with those planning their weddings as well as others planning events that are interested in your products or services. We will be marketing and reaching out to brides in Livingston, Wyoming, Ontario, Steuben, and Monroe Counties. The vendor cost to participate is $100. 1. Brides & Grooms get to meet you! We are the only Livingston County area Wedding Expo planned so far this year. In this, members-only event, we will be striving to bring motivated brides & grooms right to your booth. You can then deliver your message directly, answer questions and create meaningful connections during your first contact. This face-to-face experience cannot be achieved with any other form of advertising. 2. We?ll Take Care of the Marketing so you don't have to. You?ll benefit from our multi-media marketing campaigns in platforms such as event listing websites, social media, targeted Facebook ads, radio & print ads, targeted email campaigns and more. 3. We Provide You with Targeted Marketing Exposure. No other local marketing opportunity can provide this much target exposure for such an affordable investment. It would take weeks or months to reach the number of participants we anticipate our show can bring you in a single day. 4. You will Receive a Comprehensive Database of registered attendees at our event making it easy for you to follow up and track your leads. The list will be emailed to you within one week of the end of the Expo. 5. Our show is the ultimate opportunity to network with other local wedding professionals and establish credibility with your peers in the local wedding community. The wedding and event community thrives as a result of word of mouth recommendations via networking with one another. This is the best time to expand your business connections, marketing reach and further develop those connections.